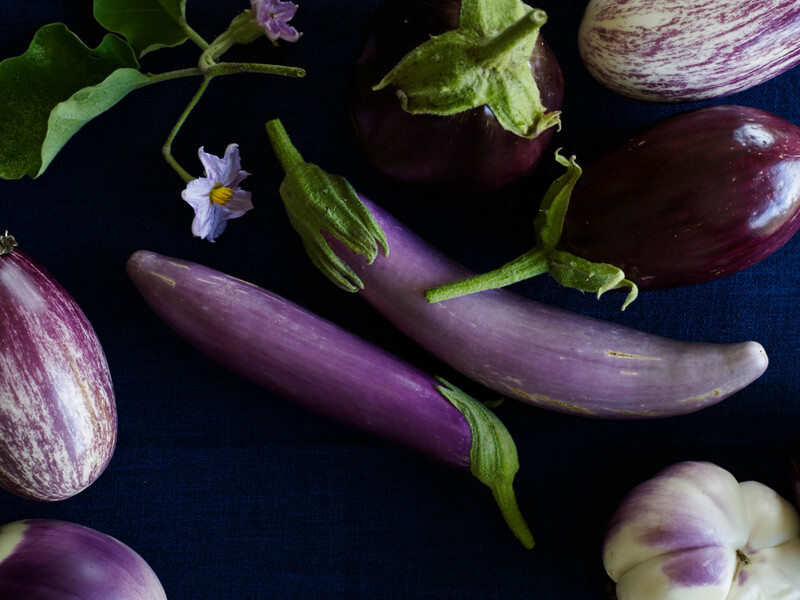 Start with a good eggplant, one that is firm, not spongy or shrivelled and without soft or brown spots, and glossy-skinned. Old specimens have more seeds and are usually bitter. Moist food will spit like crazy when it goes into hot oil, so after slicing, leave the eggplant to dry on the chopping board for about 30 minutes before cooking. When you add eggplant to oil in a pan you lower the temperature of the oil simply because you are adding cooler or colder ingredients to it. If you are cooking food in batches you will eventually be cooking in oil that is nowhere near as hot as when the first batch went into the pan. This is where trouble brews, cooking momentum is lost, oil is sucked up, cold oil added to compensate, and, well, soggy dishcloth is the result. Before adding another batch of eggplant to the pan, let the oil heat up again. Makes sense doesn’t it. Yep, that’s right. If you drain fried eggplant, or anything else fried for that matter, on flat paper towels, the paper towels will absorb clinging oil, but the eggplant if left for any amount of time will then be sitting on a soggy oily piece of paper and will eventually end up soggy, too. The old Italian trick of crumpling up paper and using that to drain fried food is a good one; the oil can drip into the crevices in the paper and air can circulate underneath the food stopping it from steaming and losing its crispness. As soon as the eggplant is removed from the pan, sprinkle it generously with salt. I use New Zealand flaky sea salt because I love it. You can use what you chose, or have, but I’d avoid iodised salt for this job. The salt will do a better job of sticking to the eggplant and drawing out flavour if sprinkled over while the eggplant is hot. Sprinkle salt on top of cold food and it mostly just sits on top then falls off when you move it.